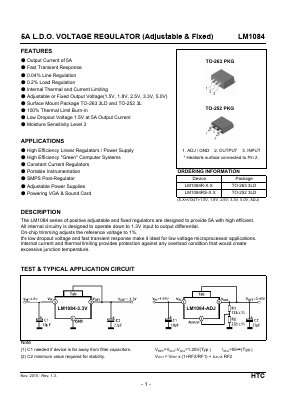 The LM1084 series of positive adjustable and fixed regulators are designed to provide 5A with high efficient. All internal circuitry is designed to operate down to 1.3V input to output differential. On-chip trimming adjusts the reference voltage to 1%. Its low dropout voltage and fast transient response make it ideal for low voltage microprocessor applications. Internal current and thermal limiting provides protection against any overload condition that would create excessive junction temperature.